Which is Better – Running Indoors or Outside? I understand we all want to Get The Best Out of Your Workout. Lets face it, sometimes that can be tricky! Conflicting theories on how to maximize your exercise would stretch anyone to the limit. 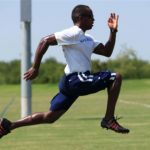 In this series of blogs I will answer some of the more common questions I get asked about how to get the best out of exercise. This topic “Running” or “Jogging” is always tricky. Keep in mind that depending on your goals and physical capabilities almost anything could be argued and proven to be a good training method, or a bad one. I get this question or one similar to it at least once a month “Should I be Running inside, or outside?” My answer is usually “it depends.” Gym rats prefer the consistency and convenience of treadmills, while others head outdoors no matter the weather. But who is right? Studies show outdoor workouts generate greater feelings of well-being, which is a great benefit. Want to feel more revitalized, energetic and positively engaged, and less tension, confusion, anger and depression? Then you might want to get outside! However, when it’s dark and cold, it can be challenging to get out. The best answer I can give is to do what works for you! If its beautiful and you want to go outside then go! If its cold, rainy, and nasty out maybe the treadmill is a better option. From reading the above I hope you can see that there isn’t 1 best way to do anything, especially “jogging” or “running” and that adding variety is important and so is being flexible with your ideas and methods. If you have any questions or comments please let us know. If you need help with your workout click on the following link and give us a call or email. Here is our website : www.LakeCountryTraining.com we are waiting to help you!